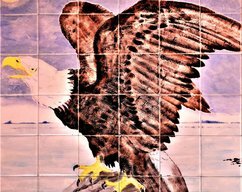 100% Genuine hand painted tile backsplash, we do not print or use transfers. 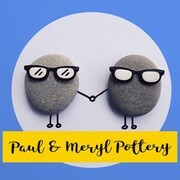 We are husband and wife artists creating our unique ceramic art in North Wales since 2010. For many the kitchen is the heart of the home, and so an attractive kitchen is essential. 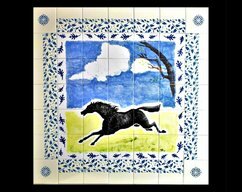 Our beautiful ceramic tile murals are a quick and simple way to revamp your home, without the huge cost of remodelling. 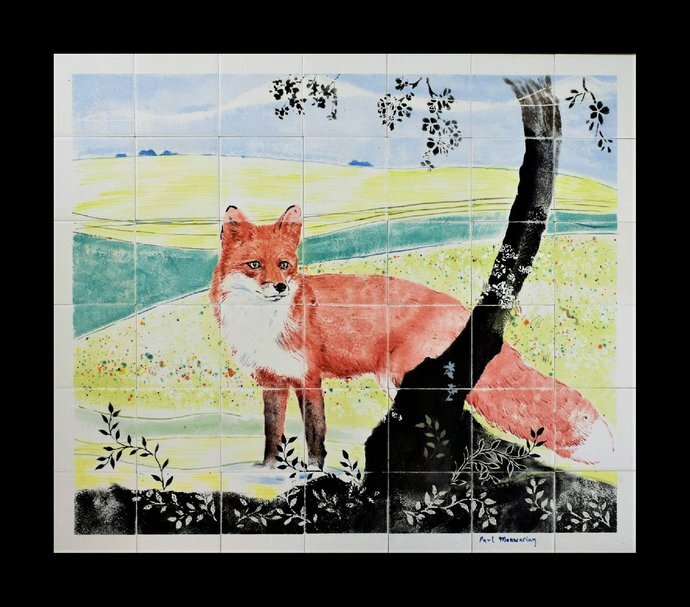 Set against a vivid pastel coloured landscape, the fox stops as it sees its prey ! This beautiful backsplash will make a wonderful centerpiece to any room. These glazed decorative tiles are used indoor and outdoor. Suitable for kitchen backsplash, as bathroom wall decor, fireplaces, etc. Wipe clean. Gloss finish. This beautiful one off hand painted mural is also signed on the front. 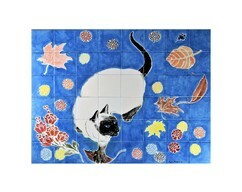 If a tile arrives broken, we will paint and post a replacement free of charge. (see FAQ's). 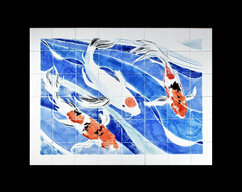 Kitchen backsplash, Hand painted ceramic tile mural, The Three Koi Carp, 32" H x 24 W"